The call came at 4:30 p.m. on July 25, 2013: An overdue Appalachian Trail hiker. It was an ordinary summertime call, though most rescue calls are for people who are injured. We arrived at the command post, run by the Maine Warden Service’s incident management team, around 8 p.m. and learned about the person who was overdue: Geraldine Largay. We spent the next 24 days looking for her. At times, as many as 30 wardens, in addition to Forest Rangers and Maine State Police, aided in the search. After Largay’s body was discovered, I read and heard a lot of misinformation about what searchers should be able to do. I’d now like to make it clear what happened when we went looking for Largay, and how searchers do their jobs. As is the case for every search, we were thoroughly briefed on who was missing, and any known medical issues at that time. It was thought that Largay had spent the night of the July 23 at the Spaulding Mountain Lean-to with the intention of hiking to Route 27 to meet her husband. As with every search, there was an ongoing parallel investigation for information that might be helpful. Early in that investigation, a woman said she had stayed with Largay on the night of July 23 at the Spaulding Mountain Lean-to, which focused on the search area between there and Route 27. 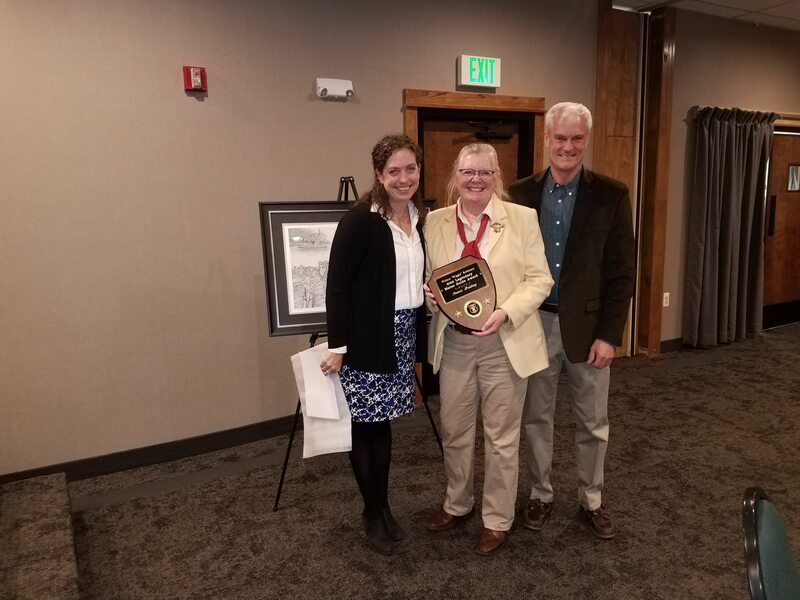 Maine wardens and searchers from one of the other certified, volunteer teams from Maine Association for Search and Rescue had ‘run’ the 13 miles of trail between Spaulding and Route 16 the day before, presuming to find she had injured herself along the side of the trail. This is called a “hasty” search and is meant to cover the area quickly, presuming the subject is on or near the trail. They also checked scenic vistas and side trails that she could have been on as well. In the meantime, the investigation was concentrating on finding AT hikers who might have seen Largay along the trail. The investigation team waited at road crossings, put up fliers asking hikers who had seen Largay to call them, and interviewed family members. 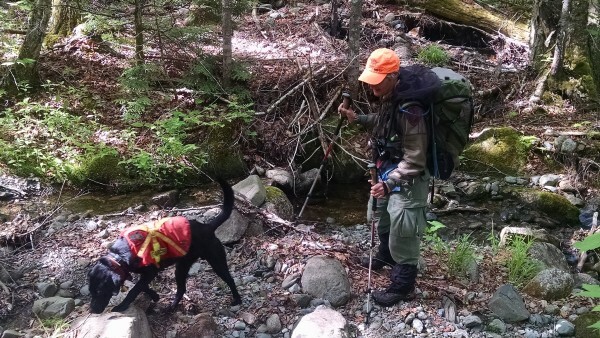 After discussions with searchers, it was decided to deploy dog teams along the South Branch of the Carrabassett River downstream from the AT crossing. This area was picked because the crossing was difficult and Largay could have been swept downstream because of higher water two days before. I deployed with a dog team, which work very well at night. Since it was urgent to find Largay quickly, we headed out and arrived at the crossing about 10 p.m. There were some tents near where we parked. We woke people up to see if to ask if they had seen Largay, but none had. Searching the riverbanks was treacherous. The banks were steep with loose rocks, and 40-foot dropoffs into the stream bed and, in most areas, thick underbrush. We had a dog team on both banks and we picked our way slowly through the dark. By 3 a.m. we had made it a mile downstream and felt that the dogs would have picked her up if she or her equipment were in the stream, so we headed back to catch a few hours sleep before our next assignment in the morning. That next morning, July 26, 2013, more dog teams arrived, along with a full call out of all search-and-rescue teams across the state and support from the Civil Air Patrol to supplement state aircraft. Because of the rough terrain, the decision was made by the Warden Service that only certified personnel would be permitted to search. Finding hikers along the AT to get information turned out to be difficult because they may cross trailheads at any time of day or even at night in some cases. 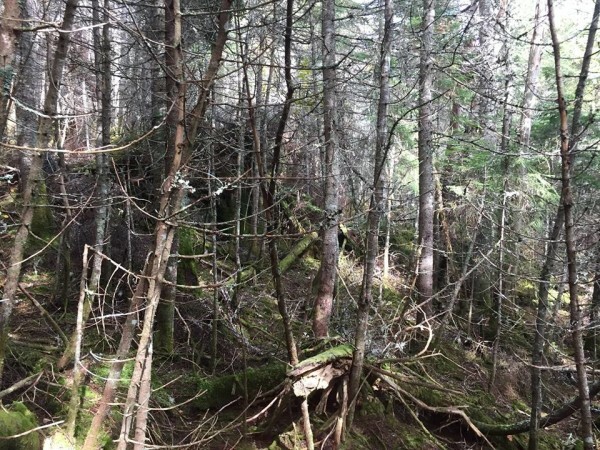 As the investigation continued, it turned out the woman who said she stayed in the Spaulding Lean-to with Largay was mistaken and it was, in fact, another hiker of similar description. Largay never reached the Spaulding Mountain Lean-to. This changed the entire scope of the search. The thousands of hours invested in searching for Largay had been in vain. Searchers can’t just go out and walk around in the woods; they need to be coordinated into the whole search effort so that highest probability areas get searched first and by the search assets most likely to find the subject. Shortly afterward, three young men reported passing Largay on Lone Mountain and identified her. The search efforts shifted between Lone Mountain and the Spaulding Lean-to. The AT crossed a trail out to Mount Abraham that would have been a short cut to town if Largay had been behind schedule. The rugged sides of both mountains have thick underbrush and the bowl between them was scoured by dog teams and grid searchers to no avail. Then it was discovered that the three young men were also mistaken as well. They had not seen Largay. The search area then expanded to the trail and woods on either side between Poplar Ridge and Spaulding Mountain Lean-tos, approximately 8 miles of the roughest part of the AT in Maine with incredibly thick woods on either side, sometimes nearly impassable. Searchers rely on a variety of tools and skill, but regardless of how many dog teams, grid searchers, aircraft or maps you have, or how much expertise you possess, executing a search can be both daunting and frustrating. Late in 2013, human remains detection dogs had what are known as “distant alerts” in the bowl between Lone Mountain and Mount Abraham. Distant alerts mean the scent was coming on the wind from a distance, with no continued scent for a dog to follow to the source. The predominant winds are typically from the northwest in Maine, which pointed to Poplar Ridge, where Largay had spent the night on July 22. 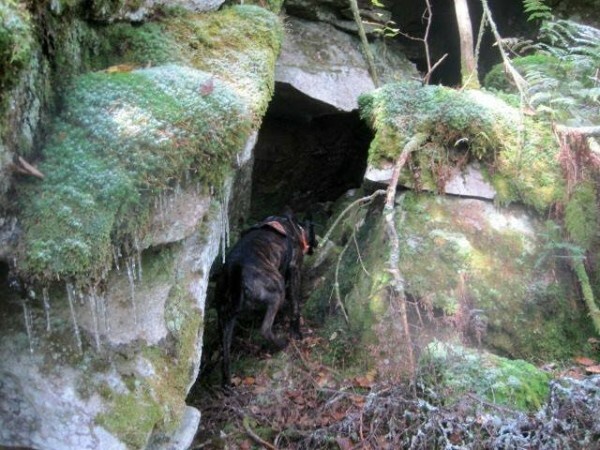 That area is treacherous, and searching it properly took several days with several dog teams. Regardless of predominant winds, the mountains and the passes between them will cause turbulence and make determining exactly where the scent for a distant alert came from difficult. In the fall, as ice or snow started appearing, the area became too treacherous to continue searching off the trail. 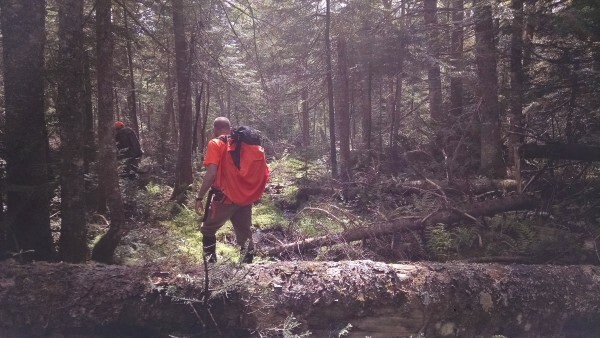 Maine’s western mountains are known for early snow, so searching was halted during the winters of 2013 and 2014. Maps can be deceptive to those unfamiliar with them. The brown contour lines on used to depict the search represent a 20-foot change in elevation. Those contour lines are fairly accurate, but a lot of ups and downs happen between them. This map shows only parts of the area in which we searched for Largay. 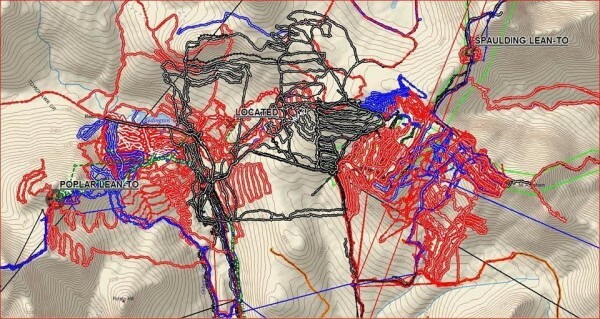 The lines are GPS tracks of searchers’ tracks. The maps also provide little inkling into the thickness of the trees and underbrush are either. Although the maps show old roads, they are overgrown old lumber roads that have been unused for more than 50 years. In some of the ravines, the sides were so steep that dogs could not get out of them and had to be boosted up 10-foot sides. None of this is been shown with a 20-foot contour line. Over the following years, many of our dog teams, as well other certified search teams, returned to the AT to search for Largay. Each time, all the data collected was shared with the warden so they would know who had searched and where. One such day, some of the dog teams got distant alerts that pointed towards higher ground. The thought was Largay may have tried to ascend to get cell phone coverage. Our search then moved over the ridge toward Redington Mountain and Caribou Pond during the summer of 2015. This lead offered no information, and the search was then scheduled to return to the area just above Oberton Stream in October 2015. Search teams had earlier covered the area with hasty searches, but this time, it would be gridded closely. About a week before we were scheduled to resume searching for Largay, she was found in the area we were planning to work. Searchers don’t like to leave people in the woods and finding Largay had become a driver for many of us. 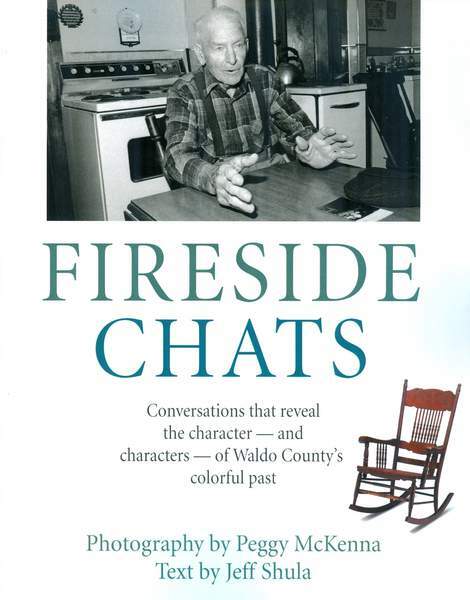 In the absence of concrete evidence, trying to hypothesize what Largay had done, what could have happened to her, and what areas had not been searched sufficiently haunted most of us. Most searches in Maine end quickly because of the skills of the warden service, using known patterns of lost persons’ behavior, accurate information, and appropriate numbers of searchers. Assignments are carefully orchestrated to prevent overlap, leaving areas unsearched or interference with each other. For example, people searching next to where dogs are searching and the dogs becoming confused and finding searchers instead of missing persons. Sadly, in this case, the search for Largay would actively continue for 27 months, with volunteer teams dedicating well over 6,000 hours and driving over 70,000 miles back and forth to the search area. This was all in addition to the thousands of hours by the Maine Warden Service and other state and federal agencies participating in the search. In the end, it turns out our dog teams were within 100 yards of Largay and never knew it. Working with paid and volunteer search teams and organizations in Maine is a great honor. Their knowledge of search techniques lost person behavior and the amazing dedication they put into finding people is heartwarming and reassuring. Many of the volunteers use their vacation time to respond to searches and most purchase all their own equipment. These folks are just the people I would want looking for a child of mine. Knowing Largay’s fate has brought most of us closure, and we hope and pray it has done the same for her family. Jim Bridge’s involvement in search and rescue started in 1974 on Adak, Alaska working both on the ground and in CH-47 helicopters. He is currently on the Board Of Directors for Maine Association for Search and Rescue (MASAR) and deploys on 15-20 searches a year with the Maine Search And Rescue Dogs (MESARD). He is a Search Team Leader and Wilderness First Responder. MASAR oversees the education, training, and standards for the 14 certified, volunteer SAR teams in Maine. All the teams work with and for the Maine Warden Service as an integrated part of their search teams.